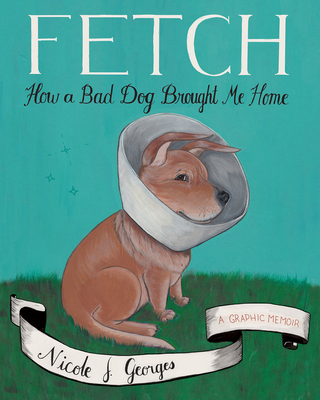 Nicole Georges' workds speak straight to the soul, and especially so in Fetch, her new graphic memoir about a misbehaving dog that she rescued at 16 and who, in turn, rescued her over the next 15 years. Extremely heartfelt and moving, Fetch is an empathetically told tale that all dog-lovers can respect and find comfort in. When Nicole Georges was sixteen she adopted Beija, a dysfunctional shar-pei/corgi mix—a troublesome combination of tiny and attack, just like teenaged Nicole herself. For the next fifteen years, Beija would be the one constant in her life. Through depression, relationships gone awry, and an unmoored young adulthood played out against the backdrop of the Portland punk scene, Beija was there, wearing her “Don’t Pet Me” bandana. Georges’s gorgeous graphic novel Fetch chronicles their symbiotic, codependent relationship and probes what it means to care for and be responsible to another living thing—a living thing that occasionally lunges at toddlers. Nicole turns to vets, dog whisperers, and even a pet psychic for help, but it is the moments of accommodation, adaption, and compassion that sustain them. Nicole never successfully taught Beija “sit,” but in the end, Beija taught Nicole how to stay. Nicole J. Georges is a professor, writer, and illustrator, who has been publishing her own zines and comics for twenty years. She is the author of the Lambda Award-winning graphic memoir Calling Dr. Laura and the diary comic Invincible Summer. She lives in Portland, Oregon. —Alison Bechdel, author of Fun Home and Are You My Mother?